depend on the rules of the electoral game, with institutions exacerbating or mitigating the effects of appearance. Since, unlike Chait, I’m a serious blogger, I won’t illustrate this post with a picture of George W. Bush in his flyboy days. Instead you get a chart. And it’s really pretty remarkable. 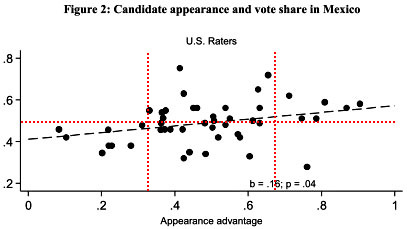 The study included ratings of 47 pairs of candidates, and as you can see the more attractive candidates had a better chance of winning (black dashed line). But that’s not all! In an effort to add some value to this study, I drew red lines at the one-third marks, and the results are truly astounding. In the middle, things are kind of a crapshoot. But when one candidate has a strong appearance advantage over the other, the results are almost foregone. All of the eight ugly candidates lost and six out of seven of the dreamboats won. I don’t know if similar results hold for women, but if it does maybe Republicans would be wise to nominate Sarah Palin after all.